Sunday morning was bright and sunny. The traffic was thick and moving fast as I got closer to the city. 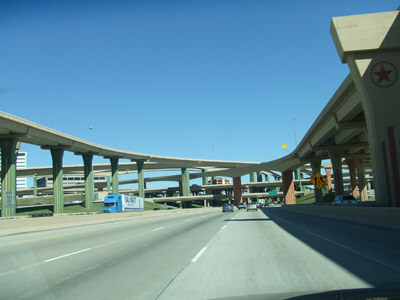 Dallas is a huge sprawling metropolis. 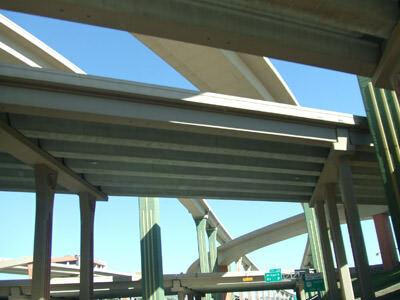 The freeway system has roads and ramps that intersect each other and are stacked on top of each other in a swirling blur of concrete and steel. My Tom-Tom GPS lady was barking driving orders at me like the commander of a dive bomber squadron.” Stay left. Take the middle ramp on the left side in 500 feet. Then stay in the right lane,” she ordered. I complied but had to squeeze in front of a large truck. I could read the drivers lips as he hit the brakes. He yelled, “Sunny beach.” I smiled and waved. Then I think he hollered, “Mother Fletcher.” His air horn blistered the paint on my trunk. These Texans are hard to understand sometimes. 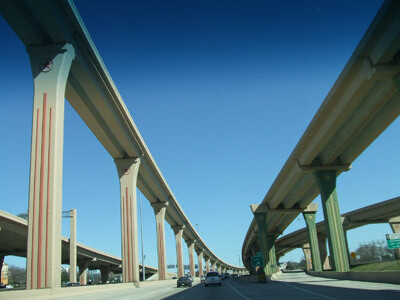 I moved through the center of the city where I-10 and I-45 converge. The engineers who built this pile of roads and ramps were good. I popped out the other side and found myself on the right highway. We made it through safely but the lady inside my GPS device was crying. I told her I loved her and turned my Sirius radio on to some soothing country-western love songs. I needed a break and some refreshment. I pulled off at the Woodland Mall outside of Dallas. It is the prettiest Mall I have ever seen. It is huge. The restaurants are in an open area. There is a canal, where you can take a cruise around the mall. Kind of like at the Venice Casino in Las Vegas. The difference is the music is not Italian. It is the strumming of guitars and the songs of Whalen and Willie. I sat outside, in the warm sun, ordered a bowl of sea food gumbo, and marveled at the beauty of the Texas ladies. They were all dressed to kill. I realized it was Valentine’s Day and I missed my wife Jo. After lunch, I drove north to Conroe; I knew this was near Cut and Shoot, Texas, where I was going to visit Tom Hart, a retired Firefighter. The exit where I stopped had several motels and hotels. 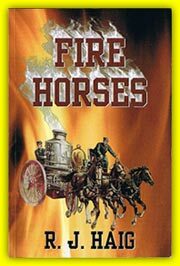 They were all too expensive for a 7th Battalion man. The last place I checked was The Supreme Inn and Suites. The rate of $55.00 was the best rate I have received on my entire road trip. The desk clerk then lowered it to $49.00 because I was good looking or maybe because I was over 65. The rooms were clean and modern. The service was outstanding and there were many perks like a laundry room, free internet and coffee anytime you want it. I highly recommend The Supreme Inn and Suites. Around seven o’clock I walked over to Mama Juanita’s Cantina and restaurant. The place smelled delicious. The smoke from the Mexican dishes lingered in the air. It was more of an eating place than a bar. I drove down the road and stopped in an area that looked blue collar. The Irish name Mahaffy’s, caught my eye, and made me think of Casey’s Bar in Detroit. I knew I had struck pay dirt when I opened the door. The music, noise and smoke blew my hat off and made my hair flap in the breeze. I walked in and saw a mix of young and old, black and white people having fun. In the back were pool tables. I could hear the pool balls banging and knocking against each other. To my left were a couple of dart boards. A husky Mexican girl was hurling darts, with an overhand toss, like Whitey Ford pitching a World Series game. I thought she was trying to knock the wall down. Above the din of noise I could hear country western music coming from the juke box. I was back in Detroit on Vernor Highway in 1969. It promised to be a great evening. In the center of all this activity was a poker tournament. I ordered a beer and asked if I could get in the game. 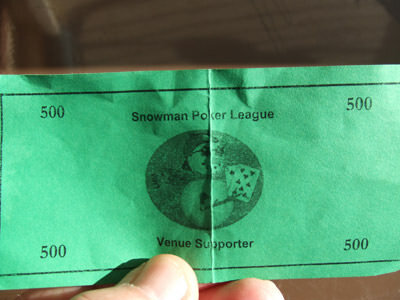 I had to join the Snowman Poker League. I now belong to two leagues, one in Florida and one in Texas. Because the bar was so full, you had to take turns with a partner to play in the game. My team mate was a young black man with ear rings. He said his name was Rocky. He looked more like Apollo Creed. We only lasted a half hour before a tattooed redhead with a gold front tooth knocked us out of the game. It was time for bed. It was a fun day thirty-four for me. I wish all my lady friends a happy Valentine’s Day and hope none of you guys forgot to tell your lady that you love her. It is important.